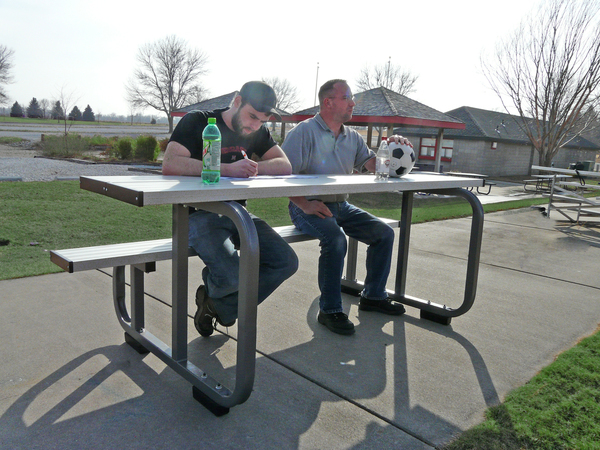 The Outdoor Sports Scoring Table can be used for basketball, baseball, or any outdoor sport. 8-ft. table seats up to four (4) people and provides a convenient 20" deep tabletop for scorebooks, computers, and microphones. Constructed of 2" square powder-coated steel tubing and 2"x10" anodized aluminum plants. Sits on molded rubber foot pads to protect powder-coating, add stability, and reduce potential for rust from wet surfaces.